Every bird watcher’s trip starts from Mabamba Swamp, one of the few remaining strongholds of the Shoebill Balaeniceps rex in Uganda. 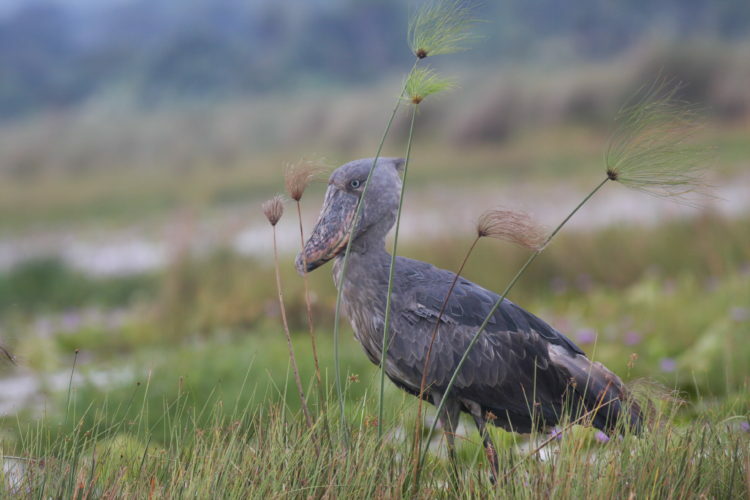 The world is estimated to have 5,000-8,000 shoebills remaining with an estimation of only about 150 pairs left in Uganda (IUCNRed List 2016). Mabamba Wetland was designated an Important Bird Area in 2001 and a Ramsar site in 2006 because of the roles it plays, among which is being a habitat for over 300 bird species, stop over for migratory birds like the globally threatened Blue Swallow and hosting threatened species like the Shoebill. This wetland supports the livelihoods of the community through fishing, sand mining, hunting, Eco-tourism, and providing water for domestic and industrial use as well as providing other ecosystem services. In the International Single Species’ Action Plan for Shoebill (AEWA, Technical Series No. 51), community based protection at a few IBA/Ramsar Sites like Mabamba Bay is encouraged, since the locals are the custodians of the natural resources and depend on the same resources for their livelihoods and therefore should be responsible for their sustainable utilization.The community in Mabamba Wetland is organized under a Site Support Group called the Mabamba Wetland Eco-tourism Association (MWETA) comprising of fishermen, bird guides, huntsmen, farmers and crafts women all depending on this same resource.The Shoebill is faced with threats like; illegal trade, habitat loss and degradation by fires, disturbance by fishermen and hunters all due to anthropogenic factors. As a way to reduce on the threats, NatureUganda has empowered MWETA through a number of projects like the Local Empowerment Programme whose aim was to enable the locals conserve the biodiversity of the site on which they highly depend for survival. This programme led to the development of the Mabamba Wetland Community Action Plan (2014-2018) whose main goal is “to conserve the biodiversity of Mabamba Bay through enhanced, sustainable income generation, raised community awareness and improved biodiversity monitoring.” Through such interventions, the locals have been made to realize the importance of wetlands in supporting community livelihoods especially through Eco-Tourism. NatureUganda hasfurther built the Biodiversity Monitoring capacity of this community over time through encouraging them to participate in the NU monitoring programmes like the bi-annual Waterbird Censusand Common Bird Monitoring (January and July), which has led to the ownership of the site monitoring programme by the community itself. This Edge project therefore comes in as a means to strengthen all the above initiatives for the Community Conservation of the Shoebill and its habitat through creating awareness on the status of the Shoebill, developing and training the community on the use of a Locally-based Monitoring (LbM) tool that is sustainable and will be used to establish the baseline status of the Shoebill in Mabamba and the adjacent Makanaga Wetlands.Monthly surveys are being done at Mabamba and Makanaga using the LbM tool to collect data on Shoebill occurrences, threats and pressures and on other indicator biodiversity like key bird and dominant plant species within a radius of 100metres. Community members have been trained in LbM and are taking part in the monitoring. This will help in further empowering the community and filling the key knowledge gaps on the Shoebill, which is NatureUganda’s contribution to supporting one of the proposed actions in the International Species Action Plan for the Shoebill earlier developed.This project is supported by the Zoological Society of London with funds from the Segre Foundation under the EDGE (Evolutionary Distinct Globally Endangered) Fellowship Programme supporting young scientists or early conservationists to carry out research on a species at the Edge of extinction.